What the farnarkling hell is happening to the Ballarat International Foto Biennale? 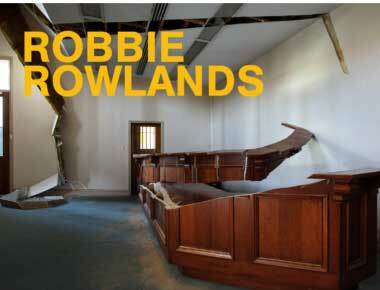 At the time I thought it passing strange that the first commission and artist-in-residence gig for this year’s Foto Biennale, indeed for the new National Centre for Photography, went to Robbie Rowlands, a ‘sculptural interventionist’ rather than a photographer. But not wanting to bag a major event in the photographic community’s calendar, we played a straight bat in our report. BIFB creative director Fiona Sweet explained it was kind of photographic anyway, because a lot of people will see in the work in photographic form. Which is an argument which would render Leonardo DaVinci a photographer. But at the end of the day creative directors get paid to make these kinds of creative decisions, so who is a simple trade journalist to judge? But the founder and father of the Ballarat International Foto Biennale, Jeff Moorfoot, AOM, was in agreement: ‘Interesting that the first commission for the new National Centre for Photography is not a photographer!’ Jeff noted concisely in a comment following the story. An exhibition dedicated to an important female photographer sounded worthwhile – or worthy, depending on your politics. Pity it wasn’t an Australian female photographer – there are so many whose work would shine given such a showcase – but hey, it is an International Foto Biennale, so an opportunity to see what women are doing in other parts of the photographic world. With the BIFB having just announced a $175K per Biennale grant from Ballarat Council, along with donations and bequests of $250K, and a further $190K in grants from the Australia Council and the State Government, (according to the last financial report – 2017 – lodged with the Australian National Charity Register), I was interested to understand why there would need for further fund-raising for the new initiative. The irony is that Noémie Goudal was once a photographer, but she has moved on. To paraphrase Oscar Wilde, very badly: To commission one scupltural intervention at a photographic biennale could be regarded as a misfortune, to commission a scuptural intervention followed by a site specific architectural installation looks like curatorial arrogance. – When Jeff Moorfoot made that comment about the interestingness of the National Centre for Photography/BIFB’s first commission not being photographic, I jotted down a fervid response, which on five minutes’ reflection I deleted, not wanting my curmudgeonly disposition to be revealed to all. But dammit, curmudgeons have a right to be heard too, you know! ‘There are so many ‘interesting’ things associated with the ‘new-look’ BIFB, Jeff – where does one start? The thing which really makes me cranky is the complete elimination of any of the fascinating history of how it came into being. If you read the BIFB ‘About Us’ section you will find not one reference to Jeff Moorfoot and the dedicated bunch who worked on the smell of an oily rag for years to get the thing up and running, and a going concern by the time it was taken over by Fiona Sweet. 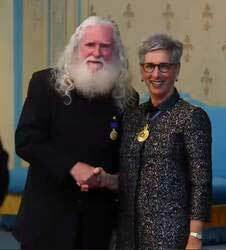 Jeff receiving the OAM from Governor of Victoria, Linda Dessau in 2017. But not a mention from the Current BIFB regime! ‘In fact, as far as I’m aware, there’s not one reference to the founder of BIFB on the entire BIFB website (‘Design By Sweet Creative’. Yes, that Sweet). This surely must be deliberate – you were awarded an Order of Australia Medal for Chrissakes! ‘No acknowledgment that the current well-remunerated administration of the event stands on the shoulders of mostly volunteers who did all the hard yards. You have all been written out of the BIFB’s history. ‘It’s as if the whole thing sprang fully-formed from the mind of Fiona Sweet herself. The other ‘interesting’ thing which saddens me is that it looks like what you might loosely call ‘the photographic community’ – we know who we are – has let one of the great innovations of the past couple of decades in Australian photography slip into the hands of a bunch of Melbourne arts luvvies who don’t seem to have much passion for photography as a creative endeavour. – And what are the chances of the Ballarat International Foto Biennale dropping the ‘Foto’ bit in a year or two? BIB – it has a ring to it! Finally, just to head off the criticism of philistinism, here at Inside Imaging and prior to that ProCounter and PhotoCounter we have been huge promoters of the BIFB for over a decade. Indeed, our review of the 2017 event was the most comprehensive and positive published anywhere in the world, and if you do a search of our websites you will see that until now we have provided the organisers the kind of support we felt photography deserved. Indeed, we continue to have no doubt that the 2019 event will be more than worth the trip to Ballarat for most lovers of photography. But after that – who knows? I agree with all of that but you left out 2 things. 2. Once bitten twice shy. I exhibited in the fringe festival in 2015 in what I thought was a ripper venue. No one told me that my large room would also be the place where a tv production of the guest exhibitors and Jeff Moorcroft would be set up and shot. Whilst trying to put the finishing touches to my work I was told to leave the room for 2+ hours; these so-called famous fotogs including Jeff did not speak to me, did not even turn around and look at the 2 walls where my work was displayed and no-one, especially Jeff, from the organisers both before, after or during the whole show introduced themselves or even spoke one word to me. We were left to our own devices and any visit to the office for help was met with annoyance from frazzled volunteers. Then with no prior warning, the same room at my venue held a wedding reception half way thru the event and all my images were pulled off the wall and dumped on the floor and I was emailed later in the week that I may like another trip to Ballarat to put them back up again. When I tried to to do that I discovered damaged and even missing work, the majority of visitors coming on a weekend found the venue closed on Sunday and those who did manage to view it were obviously just keen amateur fotogs interested in dissection and criticism, not sales, and money from the only sale I did make was stolen by the venue’s managers who went off on a long holiday and became un-contactable just before going broke shortly after the show!!! You reckon YOU have issues with the new BIFB management? Well the old weren’t so hot either! !